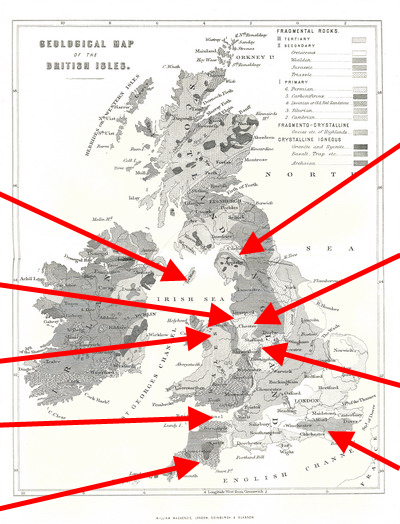 This map shows a selection of mining areas in the British Isles. Links will take you to more detail on this site. WHERE CAN I EXPLORE A MINE? 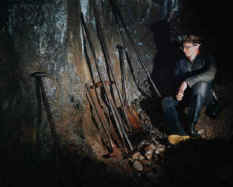 Apart from coal mines, in most mining areas there are one or two places at least that can be visited by explorers. Remember that exploring mines has its own risks from rotting wood, falling rock and deep water so you must not attempt to explore a mine unless you are experienced or are accompanied by a competent leader and have the right equipment and permission to be there. All mines belong to someone, often the owner will be someone other than the landowner so you must do your research before wandering into mines in an unfamiliar area. A good starting point is often to contact local clubs who can give you information about the mines. and of course Alderley Edge. For more details, follow the links. If you contact the Club, we will be able to direct you to the best person to advise on access. There are show mines in many areas such as Blue John (Blue John and lead) and Speedwell (lead) in Derbyshrire, Sygun (copper) and Blaenau Ffestiniog (slate) in North Wales, Big Pit (coal) in South Wales, Beer mines (stone) in Wiltshire, Grimes Grave (flint) in Norfolk and Chislehurst Caves (chalk) in Greater London. For details of these and other sites, try searching the web for 'show mines'.